Since 1989, the Judge Joan Humphrey Lefkow Day Care Center, located on the 2nd floor of the Dirksen U.S. Courthouse in downtown Chicago, has been a home away from home for hundreds of children and grandchildren of courthouse employees. With play and socialization as its focus, the Judge Lefkow Day Care Center provides a nurturing environment for babies six weeks to 15 months old. With maximum capacity for just 16 infants, the Judge Lefkow Day Care Center stands out from other facilities by offering personalized attention in a familial and welcoming environment. 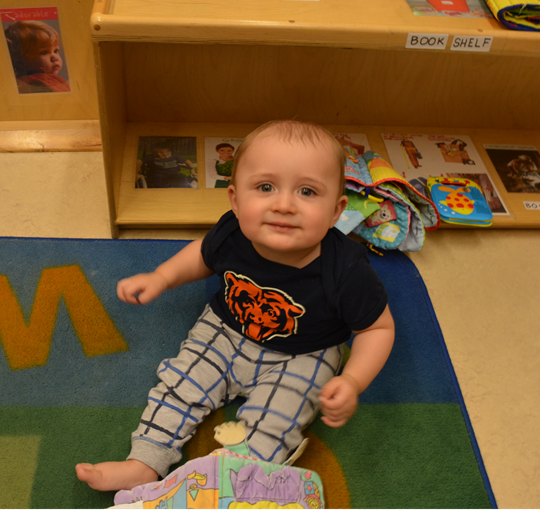 Featuring affordable and reliable care in a convenient Chicago Loop location, the Judge Lefkow Day Care Center also offers a safe and secure space, while offering parents and authorized family members the opportunity to visit their children during the workday. Entrants to the Center must clear federal building security protocols, and the Center doors are secured by key pad lock and a video monitor. At the same time, the Center is able to maintain an “open-door policy,” meaning parents and grandparents, authorized by signed permission from parents, are welcome to stop by and visit little ones throughout the day. The Center is National Association for the Education of Young Children (NAEYC) accredited. Enrollment is open to both federal employees and members of the public, while priority goes to federal employees. Three, four, and five day per week options are available. Once children reach fifteen months, an adjacent day care center is available. Judge Lefkow has no financial interest in the Judge Joan Humphrey Lefkow Day Care Center.